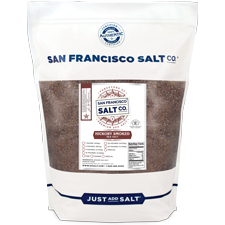 Smoked Hickorywood Sea Salt Coarse Grain | S.F. Salt Co. Enjoy a rich, smoky flavor and that delicious hickory aroma any time with this essential smoked salt. 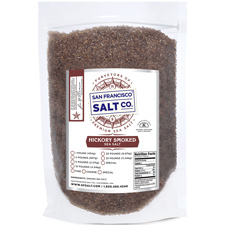 Smoked Hickorywood Sea Salt is superb on red meat and chicken, and in soups, stews & sauces. Smoked Hickorywood Sea Salt is made with pure sea salt that has been slowly smoked above a Hickorywood fire - a centuries old process. 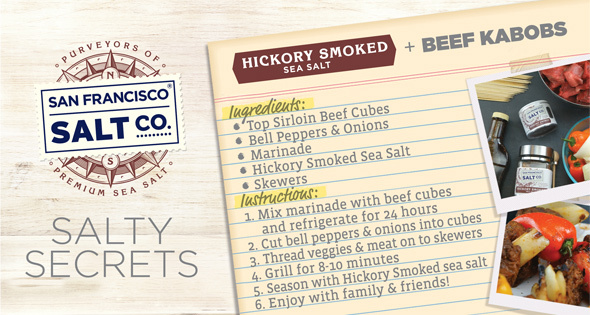 Add Smoked Hickory Sea Salt to your favorite dishes for a wonderfully smoky flavor without harshness or bitterness. DESCRIPTION - Smoked Hickorywood Sea Salt is made with pure Pacific Ocean Sea Salt that has been slowly smoked above a Hickorywood fire. Packaged in our U.S.A., GMP certified packaging facility, which is 3rd party audited by SCS Global. PROPERTIES - Our Smoked Hickory Sea Salt is non-GMO and does not contain any MSG, Soy, Gluten, Dairy, or anti-caking agents. Crafted in the USA.